TORONTO - Jeremiah Masoli and the Hamilton Tiger-Cats have put themselves in a position to battle for top spot in the East Division. Masoli threw four TD passes as Hamilton beat the Toronto Argonauts 34-20 on Friday night. The Ticats emphatically swept the season series 3-0, but more importantly moved into a first-place tie with the Ottawa Redblacks atop the East Division. Hamilton (8-7) will face Ottawa (8-6) at TD Place next weekend to open a crucial home-and-home series between the two teams. The Ticats host the Redblacks on Oct. 27. "That's it right there for top place in the East,'' said Masoli. "Obviously, we'll be full go when that comes around. Ottawa is in Edmonton on Saturday, but leads the season series with Hamilton 1-0. However Ticats head coach June Jones said his team couldn't afford to look past struggling Toronto (3-12). Hamilton will head to Ottawa having won two straight and five of its last seven games overall. Masoli was a pivotal figure in the sweep of Toronto with a combined 11 TD passes. He finished 21-of-30 passing for 338 yards with two interceptions, surpassing the 300-yard mark in all three games and for a CFL-best 11th time this season. Luke Tasker and Brandon Banks again both came up big for Hamilton. Banks had eight catches for 178 yards and a TD, while Tasker registered four receptions for 63 yards and a career-best three touchdowns. Over the three games, Banks had 23 catches for 466 yards and five TDs while Tasker recorded 19 receptions for 297 yards and five touchdowns. "You have to give Masoli credit,'' Toronto head coach Marc Trestman said. "He just doesn't do it one week, he does it every week the way he gets out of the pocket and makes a throw. 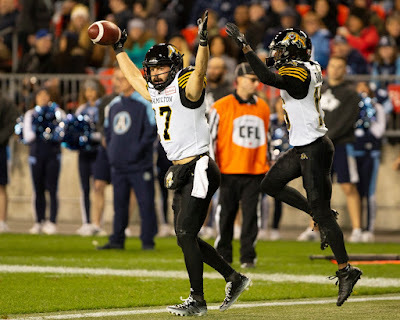 After staking Hamilton to an 18-10 half-time lead, Masoli cemented the win in the third quarter with TD strikes of five and 48 yards to Tasker. That put the Ticats ahead 31-10 and into cruise control before a BMO Field gathering of 14,184 on a cool fall night. "Jeremiah has played this way all year,'' said Jones. "We did what we had to do, it's very difficult to beat the same team three times. Masoli improved his road record to 12-7 as a CFL starter - he's 6-9 in Hamilton - and 3-0 at Toronto. He has more career wins (five) against the Argos than any other team. "I just think we had a good scheme matching up with what they do on defence,'' he said. ``Obviously, our receivers were just killing guys getting wide open, the O-line (held) up and did a great job. Toronto, the 10th CFL team since '58 to win the Grey Cup then miss the playoffs the next year, suffered its seventh straight loss. It's the longest losing streak of Trestman's CFL career. The usually stoic Trestman showed rare frustration in the second quarter following a late pass interference call on Argos' defensive back Ronnie Yell. Trestman, who was wearing a microphone on the sideline, unsuccessfully challenged the penalty and let referee Al Bradbury know he wasn't amused. "That was not pass interference,'' Trestman said. "Al, you're lucky I'm mic'd tonight. Toronto's James Franklin, making his first start in nine games, was 22-of-37 for 292 yards with two TDs and an interception while rushing for 44 yards on seven carries. Veteran S.J. Green had seven catches for 127 yards and a touchdown. Trestman said there's been a pattern in Toronto's game this season, but not a good one. "The consistency in our football team is we have errors in all three phases,'' he said. "We weren't able to turn it around and do some of the things we did a year ago.